After Pittsburgh, Pharrell Demands Trump Never Play 'Happy' Again Pharrell Williams issued a cease-and-desist letter to Trump after his joyous song was played at an event the day of the massacre — re-opening a can of worms around music usage by political campaigns. President Donald Trump, photographed on October 27, in Murphysboro, Illinois. The President was criticized by the artist Pharrell for using his hit composition "Happy" during a rally held the same day as a massacre that in a Pittsburgh synagogue. "Dear Mr. Trump: We write you on behalf of our client, Pharrell Williams, composer and performer of the hit song 'Happy.' On the day of the mass murder of 11 human beings at the hands of a deranged 'nationalist,' you played his song 'Happy' to a crowd at a political event in Indiana. There was nothing 'happy' about the tragedy inflicted upon our country on Saturday and no permission was granted for your use of this song for this purpose." Trump appeared at two events that day: an FFA (formerly Future Farmers of America) convention in Indianapolis and a Make America Great Again rally in Murphysboro, Illinois. According to The Washington Post, "Happy" was played at the Future Farmers event. So opens a letter that attorney Howard E. King sent to President Trump on Monday, two days after the massacre of eight men and three women — including two brothers and a couple that had been married for over 60 years — at the Tree of Life synagogue in Pittsburgh. 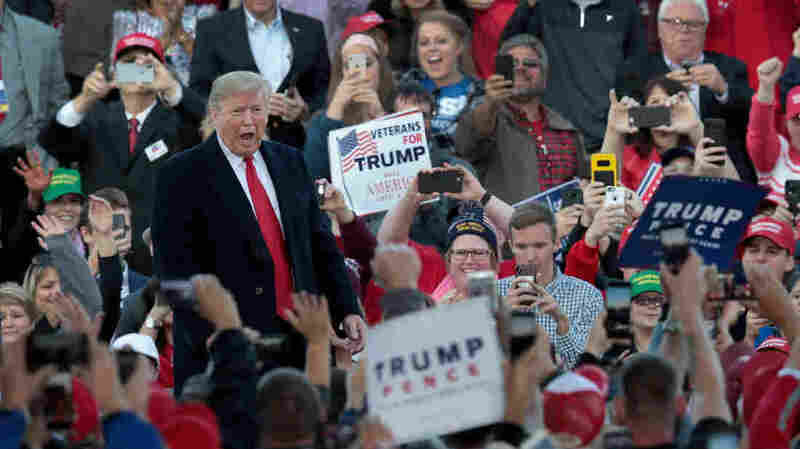 Defending his appearance at the Saturday rallies,Trump told Laura Ingraham of Fox News in an interview on Monday that "rallies are meant to be fun" — despite the fact that he opened both events by addressing the Tree of Life murders.The president is scheduled to visit Pittsburgh on Tuesday afternoon, over the objections of its mayor and Jewish community leaders there. "Pharrell has not, and will not, grant you permission to publicly perform or otherwise broadcast or disseminate any of his music," continues King's letter to Trump. Pharrell joins the end of a long queue of artists who have made their distaste for the President and his use of their songs known: The Rolling Stones, Adele, The Turtles, Michael Stipe of R.E.M., Steven Tyler of Aerosmith, The O'Jays, Neil Young and Earth, Wind & Fire among them. The use of these songs by politicians and campaigns whose policies are antithetical to those musicians' values is a perennial topic on the campaign trail, but one that is not very well-understood — and can end up completely out of the artists' control. Even so, that doesn't mean a campaign is fully protected. As ASCAP explains, even if a campaign signs a contract with them, they could still be sued on three grounds: "The 'Right of Publicity,' which in many states provides image protection for famous people or artists; the Lanham Act, which covers the confusion or dilution of a trademark (such as a band or artist name) through its unauthorized use; and 'False Endorsement,' where the use of the artist's identifying work implies that the artist supports a product or candidate." A 2016 BMI contract obtained by NPR that is specific to political campaigns makes the situation plain, and offers artists a back door. In its "Music License for Political Entities or Organizations," BMI inserted a notable provision: "... a specific work may be excluded from this license if notice is received from a BMI songwriter or publisher objecting to the use of their copyrighted work for the intended uses by [the political entity or organization licensing the music]." BMI tells NPR the agreement has not changed substantively since 2016 and was not drafted in response to Trump's campaign. A source confirmed to NPR that ASCAP offers a similar license specific to political campaigns, with similar language. And then there's Global Music Rights. Global Music Rights is a relatively new performance rights group which was launched by infamous Eagles manager and power broker Irving Azoff in 2013. Broadly, Azoff's strategy was to amass a small and very exclusive catalog of music — a catalog so desirable that the the company would basically be able to basically charge whatever it likes for licenses. And it did: Drake, John Lennon, Prince, Bruce Springsteen, Ira Gershwin, Jon Bon Jovi and the principal members of Metallica are all within its catalog. In the short time since its founding, the company has become powerful enough to be criticized for monopolistic practices. Guess who else is represented by Global Music Rights? The not-very-pleased-right-now Pharrell, whose lawyer tells NPR that Global Music Rights has "not granted a license" to Trump. And, by the sounds of it, never will. This article was updated at 3:22 p.m. with more current song catalog numbers, as provided by ASCAP.